Say goodbye to searching “circuit laundry services near me” on Google. Laundrapp’s laundry and dry cleaning service has ousted circuit laundry as the best way to wash your clothes! No more trudging to your local laundrette to insert your circuit laundry card – Laundrapp comes to your door! Replacing traditional laundry methods, App of the Year Laundrapp prevents you from having to drop off and collect your garments, and lets you focus your time on what really matters. Since its emergence, circuit laundry cards promised quick and easy washing without needing to worry about having the right change – well now you don’t even need a card. Just your phone to place an order on Laundrapp – and it takes seconds thanks to ‘Instant Order’ . Type in your postcode now to check if Laundrapp covers your area! To use this mobile laundrette, all you need to do is schedule an hour slot on Laundrapp’s app when you’ll be free for us to pick-up your laundry. We’ll then pick-up, clean and deliver your dry cleaned garments in 48 hours! Unlike other laundrettes, Laundrapp’s open seven days a week! Now that’s what you call on-demand laundrettes! Laundrapp is the easiest laundrette option you have – offering to wash, iron and dry clean your laundry, bedding, towels and other homeware items! 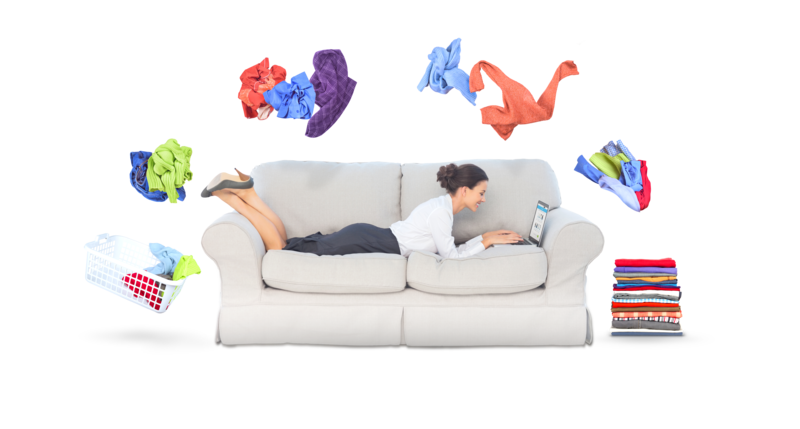 Our mobile laundry service lets you wash everyday clothes , dry clean special garments, and appropriately clean household linen, from table cloths to bedsheet cleaning! Laundrapp takes care of your laundry so you can concentrate on your precious time! Don’t take our word for it, consider the tens of thousands of happy customers we’ve serviced since we emerged – you’ll be able to find stellar customer reviews on Trust Pilot! Our most serviced laundry and dry cleaning items include shirts, pants, dresses, suits, and jackets, bedding, duvets and towels! We choose only the most high-quality laundrettes in your area – whether that be the best laundrettes in London or the best laundrette in Edinburgh – to meet your quality laundry standards. Laundrapp’s laundry and dry cleaning services are now available across the whole of London with free collection & delivery! Discover why Laundrapp is London’s laundrette, and the convenience of never having to carry a heavy load of clothes to your local laundrette again. That’s right – Laundrapp will collect, clean and deliver dry cleaning and laundry right up to your door,anywhere in London – including: Canary Wharf, Waterloo, Hampstead, Chelsea, Balham, Stratford, Holborn, Bayswater, Bank, Angel, Wandsworth, Hammersmith, Brixton, Wimbledon, Streatham, London Bridge, Notting Hill, Camden, Clapham, Earl’s Court. Can’t see your area? Type in your postcode today and see what laundry and dry cleaning services we can offer you! Remember, unlike most London laundrettes or dry cleaners, Laundrapp is open 7 days a week – with affordable prices and a convenient laundry pick up and collection service too. Sound good? Then order today and see why thousands of people across London are switching to Laundrapp.